One thing Canadians often say when speaking with Americans about their two countries is that, because of the media, Canadians get to know everything about the USA, but Americans don't get to know nearly as much about Canada. This is especially true in music, where American performers are known throughout our northern neighbor. But while some Canadian artists have become popular here, some of the best-selling or acclaimed artists in Canada are virtual unknowns south of the border. The nation has long had Canadian content laws requiring a certain portion of music programming on broadcast stations in the country to be of Canadian origin. That, and a much more supportive atmosphere in the public sector for the arts has helped to encourage a flourishing music scene that over the years has produced some outstanding artists in a wide range of styles. This week we feature another of those performers who is more or less a household word in his home country, but who remains an obscure figure in the US, despite the fact that the music he plays is very American. It's Colin Linden, whose newest release, his fifth, is entitled Through the Storm Though the Night. Colin Linden started on the path toward his bluesy, gospel influenced music rather early in life, when he struck up a friendship with Howlin' Wolf at the age of eleven. Linden has long been a friend and collaborator with the members of The Band, appearing on their 1993 comeback album Jericho, whose opening track Linden wrote. His other associations include working as a producer or songwriter with T-Bone Burnett and another of Canada's great musical treasures Bruce Cockburn. While not all of Linden's records have been released in the US, some of his previous efforts tended toward a kind of bluesy folk blend. Linden wrote in the liner notes for this CD that "Many of the songs were inspired by the great Gospel music of the 40s and 50s." He thanks his longtime friend Ken Whitely for "leading" him to the music, and invites Whitely along for the CD. Though most of the music is original, Linden includes two old gospel standards and a blues song by Willie Dixon. Linden is an able guitarist who plays everything from rock style electric to low-down acoustic Delta blues tastefully. As a vocalist he is somewhat reminiscent of his friend T-Bone Burnett. Linden is joined on the album by two members of The Band, Rick Danko and keyboard man Richard Bell who joined the venerable group when it re-formed four years ago. Bell was also a member of Janis Joplin's Full Tilt Boogie Band. Danko appears doing some backup vocals. Other regulars on the CD include keyboardist Janice Powers, bassist John Dymond and drummer Gary Craig. Giving the gospel influence some authenticity are the several appearances by the Fairfield Four, one of traditional African-American gospel's most durable and respected vocal groups. A trio of horn player also appears on several pieces. However, gospel is hardly the only influence on Through the Storm Through the Night. In broad terms, I suppose the album could be called "roots rock," with its mostly electric instrumentation and a sound that occasionally, and understandably is reminiscent of The Band. Many blues singers over the years got their start singing Gospel in church. But the blues, of course, was once considered the devil's music. The two come together particularly well on a Linden original called No Rest for the Wicked. The arrangement is low-down and dirty, but the Fairfield Four adds their inimitable presence. It's another of the album's highlights. One of my favorites on the album is Homesick in My Own Backyard, with its great lyrics and interesting arrangement, revolving around the acoustic guitar and a horn section sounding like a Salvation Army band. 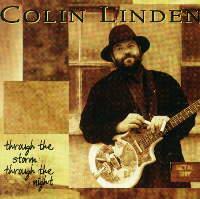 Colin Linden's newly released album Through the Storm Through the Night is a tasteful rootsy blend of blues, rock and gospel by a Canadian artist, songwriter and producer who deserves wider recognition south of the border. Indeed, this album was recorded and released in Canada in 1995, and is only now being issued in this country on the small independent Nashville-based Compass Records, known for their bluegrass and singer-songwriter recordings. The album combines tasteful, classic-style playing all around, especially by Linden on his various guitars, and his appealing, honest vocals. The added guests, including two members of The Band and the gospel singers The Fairfield Four, make this a most worthwhile recording. Sonically, the album has some problems. The proportion of the instruments in the mix is quite good, as is the treatment of Linden's vocals, but the recording was heavily compressed, robbing the sound of the dynamics that this kind of music should have. And on a minority of the tracks, the drums and rhythm section suffer from outright distortion seemingly from excessive levels. This does tend to detract from an otherwise excellent album. Sonic foibles aside, the growing number of fans of so-called American Roots Rock, ranging from Baby Boomers to their kids, will likely find much to enjoy on this album by a talented veteran Canadian artist. (c) Copyright 1997 George D. Graham. All rights reseved.